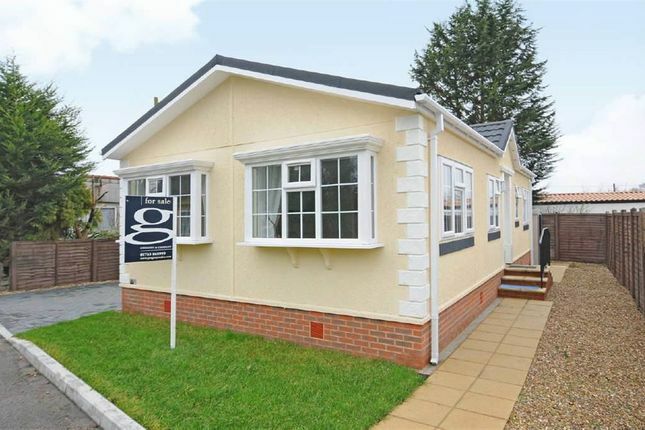 A nearly new (2013 model) 36ft x 20ft Omar Regency two bedroom park home situated on the popular Cranbourne Hall Park. This park home comes furnished and offers good sized accommodation with low outgoings. Viewing is highly recommended. Steps lead up to the front door that gives access to the hallway. There is a large dual aspect sitting room across the front of the home that has a fireplace with an electric flame effect fire and an opening to a dining room. The kitchen has a range of wood effect units, built fridge/freezer, dishwasher, washing machine and oven, hob and extractor hood. There is also a door to the side, partly tiled walls and a cupboard housing the Glow-worm boiler. There are two double bedrooms; bedroom one has a walk in wardrobe and an en-suite shower room, whilst bedroom two has a fitted wardrobe. A bathroom with a modern white suite completes the accommodation. Outside, there is an enclosed garden with lawn and shingled areas, a plastic garden shed and outside lighting. There is also a block paved off road parking space. Cranbourne Hall Park is a large site of approximately 250 park homes, managed by The Haulfryn Group. The park is situated on the outskirts of Windsor, in Winkfield, just past Legoland. There are local shops close by and buses serve the local area. Pitch fees - The pitch fees for this property are currently £167.00 per month. Council tax - Band A. By appointment with Gregory and Company - 242 Dedworth Road, Windsor, Berkshire. SL4 4JR - Call us on . This home is being sold with numerous pieces of furniture included. We would inform prospective purchasers that these sales particulars have been prepared as a general guide only. A detailed survey has not been carried out, nor the services, appliances or fittings tested. Room sizes should not be relied upon for furnishing purposes and are approximate. Floor plans are for guidance and illustration purposes only and may not be to scale. Items shown in photographs are not necessarily included in the sale. If there are any important matters likely to affect your decision to buy, please contact us before viewing the property.